The Wright Wreport: Day 1 NYFW: Not Boring. It's Beautiful! Day 1 NYFW: Not Boring. It's Beautiful! Knit turtleneck and satin-faced organza tulip skirt from the Christian Siriano Fall 2011 collection. Photos by Frazer Harrison/Getty Images. BEST IN SHOW – Perusing the Christian Siriano run of show – the program that gives descriptions of the pieces in a designer’s collection, as well as credits and sometimes his/her inspiration – I counted the word “black” 37 times. I was not pleased! It was one of the last shows of the night of the first day of an eight-day fashion frenzy. I was already about to “black out” from lack of food and a deep need for sleep. This would surely do it, I thought. Boy was I wrong! The show was sheer pleasure – literally. Weaving tweed and knit into an interesting interplay of textures, CS commenced with classically detailed jackets – from doubled-breasted to blazer to zippered. Atop sheer chiffon asymmetrical skirts, the jackets worked magic. And thus began an interplay of the light and shadow within the black. For Fall 2011, Christian Siriano likes heavy jackets over light, sheer skirts. CS achieved a balance of repose and restlessness by interspersing heavy jackets with shawl, exaggerated batwing and asymmetrical collars paired with flirty, ruffle-bottomed, billowing skirts. Occasionally, he played it straight, bringing the classic men’s trousers into feminine space; sometimes cuffing them, other times giving them wide legs with oversized cuffs. Trouser fabrics veered from wool to silk crepe and were paired with luxurious cashmere. The black theme continued with a parade of beautiful, feminine ladies in black. A billowing satin-faced organza tulip skirt. A boucle backless trumpet gown. A silk organza draped cocktail dress. But the textures, weight, movement, and moments accentuated their different shades. It was a sea of black, and a lovely sea it was. When the color came – in mauve and moss – so satisfactory was the black that the former didn’t make much of an impact. The silk chiffon short sleeve blouse and silk organza ruffled ball gown skirt was the last piece in the show – the skirt looked like a chenille blanket – was the only let down. It was quickly forgotten, though, as raucous applause awaited the man of the hour. With the words of Xiao Lei as his guiding message, Tadashi Shojo hit the mark on his mission to combine a sense of transcendence with the beauty of nature. He set the tone for this Far East-inspired ideal with ethereal music that was relaxing and sensual. One of the more down-to-earth creations from the Tadashi Shoji Fall 2011 collection. Emerging from a painted background of blue sky filled with fluffy white clouds, TS’ models, translucent in a pale makeup and straight hair, were almost angelic. They breezed down the runway in wool jersey and lace creations trimmed in feathers, evoking the imagery of birds. TS’ extensive use of chiffon in vibrant colors of sun and sea, green fields of purple flowers and garden beds of begonias indeed brought a feeling of transcendence. Hand-cut organza floral designs added dimension to diaphanous gowns. While TS’ vision exists in a realm up in and near the clouds, he managed to also beam it down to earth – if only briefly – bringing to his aesthetic a retail aspect. He worked with stretch wool jersey and silk crepe to create a body of dresses — one-shoulder, off shoulder, and halter — and ensembles with which the average consumer can identify. Of note was a washed silk crepe halter top paired with a black-draped pencil skirt. If the first day of Fashion Week is any indication, red is going to be an It color for fall. While a number of designers ventured into the zone, it was BCBGMaxAzria who came away with the most touches. For fall, he’s keeping things simple. 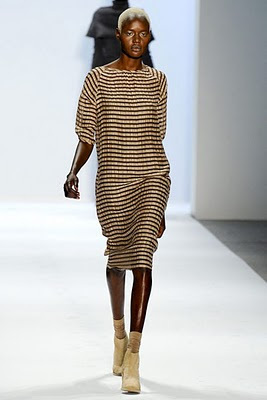 The model, Ajak, sporting a hot 'do and an apricot/smoke silk/linen iridescent stripe sack dress from the Fall 2011 collection of Richard Chai. The most visible manifestation of this is the white turtleneck body suit underneath skirts and dresses. It is further informed by voluminous silhouettes that could be rendered dowdy in some hands. Max deftly delivers sophistication along with his simplicity. For spring he showed many body-skimming looks, particularly a fetching parade of little white dresses. What saves these autumn dresses and skirts from appearing shapeless are low-slung belts, panels at the hip and thin fabric strips that bring to mind Normandy architecture. Here to save the day, too, is color-blocking. It is in the latter that the red really stands out – particularly against b&w and white and navy. Imagine a portrait bearing the images of several people, but one in particular commands the attention. That is the precise effect of the red. BEST HAIR (TIE) – Here one is sitting in the Richard Chai “Love” show a little tired and trying to keep both eyes open. The clothes are not boring but neither are they beckoning. Sure, the series – wing coat, blazer, military coat et al. – in charcoal degrade stripe is serviceable. Further, the funnel neck sweater will keep the neck warm on a day when the mercury is hovering in the mod-20s. They do fold nicely, don’t they. Moreover, while some of the pleating is a little undisciplined, there is something to admire in the different texture pairings i.e., georgette and merino wool. Yet one is about to catnap – until. The fall 2011 collection of Irina Shabayeva is informed by cool hair and hot colors.